Sewn With Grace: Thank You! Thank you, from the bottom of my heart, for all the kind, loving and supportive comments you showered on me. I have read and reread each one. I know I need to give myself time to settle and grow accustomed to my new surroundings. I also need to be thankful and stay positive. We visited another church yesterday and it felt so good to worship and be taught from God's Word. Today I started off the morning in Ephesians 5. One of the passages that have settled on my heart today is "…and find out what pleases the Lord." (Eph 5:10 ) I needed to be reminded that my kids are watching how I am handling the move and though we are sad, my husband is so happy to have us all here with him again after six long months. I love how God's Word changes your perspective for the better. I ordered some fabric from Kerri and it arrived on Saturday. Opening a package of fabric is like getting flowers or finding the perfect vintage treasure for me. Since my sewing room will not be set up for at least another two weeks I found my box of scrap fabric and starting cutting them into 2 1/2" strips and blocks and 4 1/2" blocks. I was inspired by Allison's quilt. 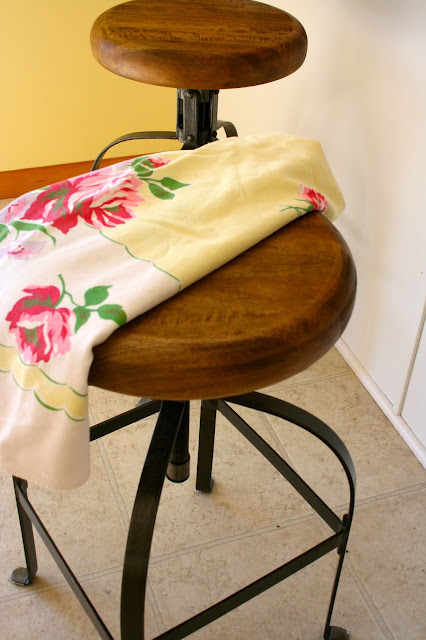 Over the weekend I found two stools at World Market that look good in the kitchen and scored a wonderful vintage rose tablecloth at a local shop. 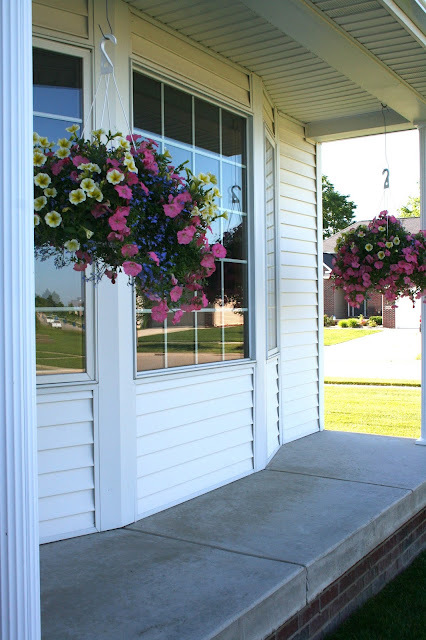 I also found some beautiful hanging baskets on sale not too far from my house. All in all, it was a good weekend to recharge and refocus. Your fabrics are so pretty! What a happy package! With all the change, isn't it wonderful that the word of God never changes. It is always there to provide comfort. Soon enough you will be back in your rhythm. Our pastor has been basing his sermons on Ephesians for several weeks now. Isn't that a nice coincidence? I love, love, love all your fruity fabrics. I have started a little crib quilt for the grandbaby. I saw a quilt wall hanging that just had the best designs on it. So I've adapted it. It has some applique and some piecing. Hope this week just gets better and better for you. I think as a mom you are so on the right track about 'what did we learn from this'. Also you've recognized that having your complete family is the goal of the move. Bumps are part of the journey and I think you have recognized the key point - your kids are watching. 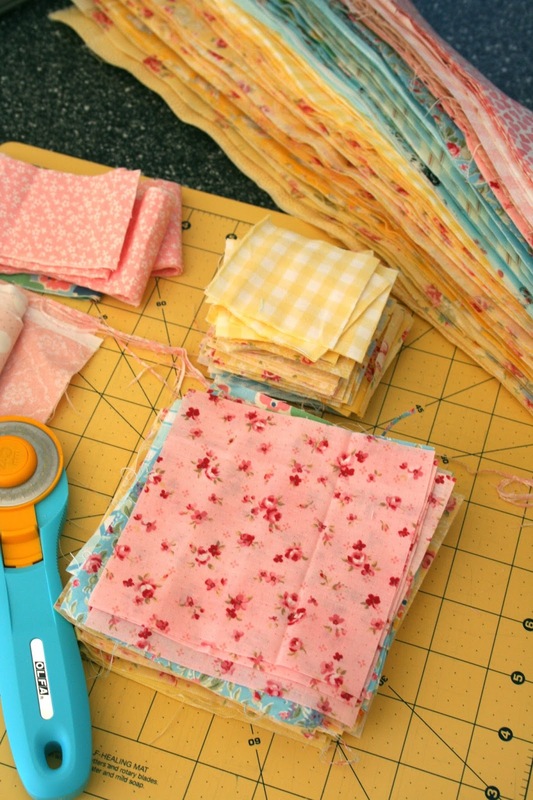 Making new friends is not easy, but finding a church home and quilting friends will help you make strides. Have a brighter week. "And we know that for those who love God all things work together for good, for those who are called according to his purpose. Romans 8:28"
Bless your heart, change is generally not easy for most of us. I believe God will put the right people in your new path. Once you decide and settle into a new church, hopefully there will be a good Sunday School class or women's group. All that gorgeous fabric will surely sooth the soul. I have been waayyyy too busy lately and had zero time at my quilting table and decided to change that. 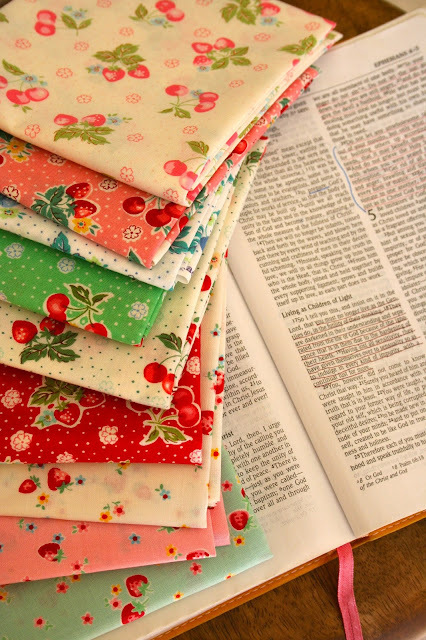 I cut, pressed, and sewed last night for about two hours and felt renewed. I hope your sewing room is ready very soon so you can get back to it. Prayers for you and your family! Hi Renee, I so understand all your feelings-when we moved to a new state six years ago, I was so lonely. When you are retired and move, it is so hard to make friends; I read a couple of great books from Focus on the Family and eventually made some great girlfriends. I also started blogging and that helped me so much-it took away my loneliness. Hang in there, it will get better; I love all your fabric and know things will settle in soon. I saw one of your photos on pinterest and followed it back here to your wonderful blog. Thank you for sharing with all of us. So nice to find such a heartfelt Christian blog. I've really enjoyed reading back through your posts and pinning your photos.